The Battle of Hampton Roads, which took place in March, 1862 in Virginia, was a naval engagement during the American Civil War. Although it did not produce a conclusive result, the battle is considered historically important, since it was the first time that ironclad warships had met in battle. It was also highly significant in influencing other navies – principally those of Britain and France – to cease construction of wooden ships and move toward all-ironclad fleets. In the spring of 1861, shortly after the outbreak of the war, President Lincoln ordered a blockade of the ports of those states which had announced their secession from the Union. By the end of April, the blockade had been extended to the anchorage at Hampton Roads in Virginia, a roadstead just short of Chesapeake Bay. This was of great military importance, since it marked the confluence of the Nansemond and Elizabeth Rivers with the James River, and since Confederate forces controlled the southern side of the river thanks to their base at Norfolk and the Portsmouth navy yard. The Confederacy had placed two batteries at Craney Island and Sewell’s Point, in order to defend the navy yard. Fort Monroe, however, and therefore the nearer part of Virginia Peninsula, remained in Union hands. Once the blockade began to be enforced, the Confederate forces were almost completely prevented from moving between Richmond and Norfork and the ocean. The blockade was reinforced by powerful Union ships, carefully positioned out of range of the Confederate batteries but under the protection of those of the Union. This state of affairs persisted for almost a year. Although ironclad warships had already been built by France and Britain, the United States Navy was unconvinced of the worth of armored ships. The Confederacy was therefore the first to start work on an ironclad. Because of the need to work fast, the ship was not built from scratch – which would have taken nearly a year – but instead built up from the ruined hull of the sunken USS Merrimack. The prow of the ship was fitted with an iron ram, while it was armed with ten guns. Two-inch thick armor plates were added, an increase from the original one-inch specification. Named CSS Virginia, the ship was finally commissioned in February 1862. Meanwhile, news had reached the Union command that the Confederacy intended to build an ironclad ship. 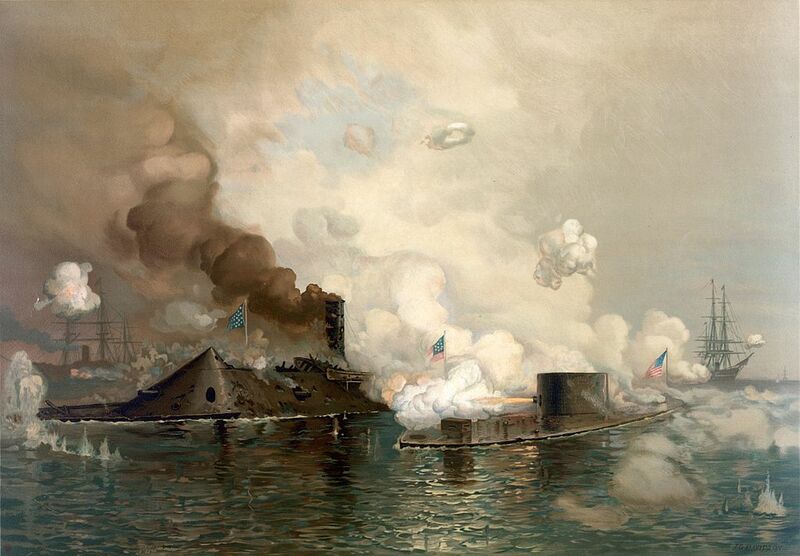 This caused considerable concern, and Congress authorized the building of the Union’s own ironclad, USS Monitor. The most notable feature of this ship was that it had just two large-caliber guns, mounted in a large, cylindrical turret which could rotate thanks to power from a steam engine. This greatly reduced the manpower needed to operate the ship’s armaments. The entire turret was coated with eight-inch thick iron plates. Even though the Confederacy had a head start, USS Monitor was commissioned only a few days after the CSS Virginia. 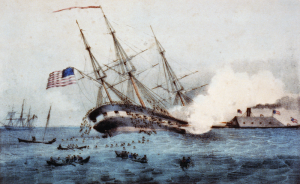 The battle lasted two days, with Franklin Buchanan commanding Virginia and John L. Worden captain of Monitor – although neither man was officially in overall command. Early on March 8, Buchanan sent Virginia into Hampton Roads with the intention of mounting an immediate attack. The ship was joined en route by five more ships. Meanwhile, the Union also had five ships in the roadstead, accompanied by some support vessels. Several other ships were moored near Fort Monroe; one of these was the Roanoke, which – along with two other ships – ran aground as the USS Virginia approached. Two of the three were put out of the battle; the third, the frigate Minnesota, returned to action later. After an unimportant early skirmish, Virginia attacked USS Cumberland, ramming the ship and holing her below the waterline. The ship sank quickly, with the loss of more than 120 lives. Despite this success, however, Virginia herself was fortunate not to go down too, since the ship’s ram had become lodged in the hull of the Cumberland. Virginia then advanced on USS Congress, whose captain ordered her to ground in shallow water, to prevent a repeat of the Cumberland’s fate. However, after an hour, the position of the USS Congress was hopeless, and Smith surrendered. An assault by Union shore guns enraged Buchanan, who decided to fire upon the USS Congress with red-hot cannon balls. The ship caught fire, burning fiercely until she exploded that night as the flames reached her store of gunpowder. Virginia herself had suffered some damage by now, making the already slow ship even more sluggish, while Buchanan had been wounded when a rifle shot hit his thigh. The James River Squadron, meanwhile, was attacking the Minnesota, and Virginia now joined the assault – but her deep draft made it impossible to get close, and the attack was called off as night fell. Instead, Virginia returned to waters controlled by the Confederacy, intending to return the following morning. At this point, the Union forces had lost 400 men and two ships, with three more aground; the Confederacy had suffered two deaths and retained all its ships. This was the worst defeat suffered by the U.S. Navy until World War II. Edwin Stanton, Secretary of War, warned that Virginia might even manage to launch shells at the White House, though he was reassured that this would not happen, since the ship was too large for the Potomac river. Nevertheless, Monitor was moved as quickly as possible to Hampton Roads in order both to protect Union ships and to stop Monitor from threatening its cities. Captain Worden was ordered to protect the Minnesota, and took up station nearby. At daybreak on March 9, Virginia arrived and attacked Monitor. Monitor’s unusual design startled the Confederate commanders, who initially took the ship to be simply a boiler being towed down the river for repairs. Once the real nature of the ship became clear, however, a lengthy battle began, lasting many hours. Virginia opened with a shot toward Monitor; this missed and hit Minnesota, prompting that ship to fire a broadside in response. Because both ironclad ships were stronger in their defense than they were offensively, and were without ammunition capable of fully piercing the opposing ship’s armor plating, neither side could make a decisive breakthrough. After some hours, the battle was ended by a freak occurrence: a wayward shell from Virginia hit Monitor’s pilot house, exploding. The debris temporarily blinded Worden, which forced Monitor to draw back until Lieutenant Samuel Dana Greene, the executive officer, could take over command. Although Monitor then returned to the fray, Virginia’s crew was under the impression that she had fully withdrawn. Because of this, coupled with the fact that Virginia herself had suffered considerable damage, Jones decided to take her back to Norfolk. Monitor returned to the scene to find her opponent moving away, and Greene in turn misinterpreted the move as a retreat. Virginia spent several weeks in dry dock undergoing repairs. Meanwhile, the Union blockade had been reinforced, with several new ironclads taking part. 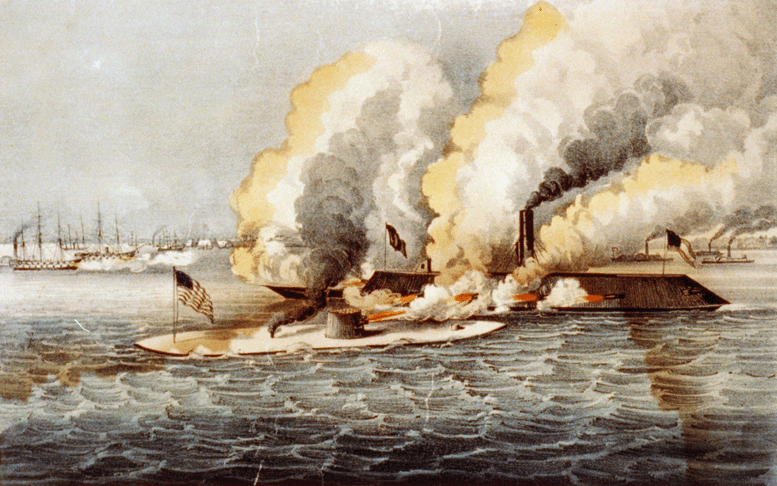 A standoff took place, in which the captains of the CSS Virginia and USS Monitor both declined to engage the other ship in combat. On May 9, Major General Benjamin Huger of the Confederacy took the decision to abandon Norfolk as now being of minimal strategic importance. Since Virginia was too large to move upriver, she was deliberately sunk by her own side to avoid allowing her to be captured. Monitor’s fate was different: in December, having been sent to North Carolina, she sank in a storm. Overall, the battle was a draw. The Union had lost considerably more men and ships, but the vital blockade had remained intact. On a global scale, the battle of the ironclads drew the attention of many other navies. Russia, Britain, and France, in particular, rushed to build ironclads, many of which were heavily influenced in their designs by that of USS Monitor. Rams were also incorporated into a number of such ships, although this innovation was something of a dead-end, as by 1900 naval guns were sufficiently powerful as to make close encounters between ships nearly impossible. Honestly. I don’t even know how many people died and that’s all on need to know.